When ink on paper finally goes the way of the Dodo (or the eight track), as certain dodos have predicted, heaps of printed papers will remain on earth. So the question will be what to do with what's left? Ray Bradbury suggests in his 1953 dystopian science-fiction novel, Fahrenheit 451, that incineration is an option, but in truth the looming paper redundancy does not demand such hot draconian measures. When every bit of recorded human knowledge is digitized and available through Google or Jeeves alternative uses must be found for untold metric tons of paper, and particularly all those pesky books. So what is needed is the repurposing of these venerable materials into useful life-enhancing goods. Any suggestions? "There was a time, not so very long ago," wrote Betty Pepis, author of interior decoration books, in the introduction to 65 Ways to Decorate, "when books had little to do with the decorating of a home. Banished from the front parlor or the formal living room, they were confined to a den or a library reserved for the purpose... But homes have changed a great deal in the past two decades. Space is tighter. The front parlor is often the only parlor... So it has happened that books, of necessity, have become an inevitable part of the contemporary all-purpose living room... Integrating the library pleasantly into the home décor is a challenge that architects, designers and decorators have had to solve." 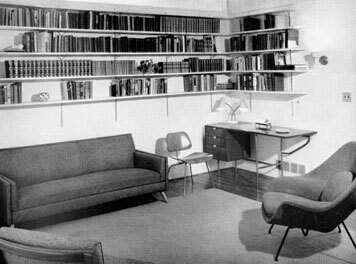 Indeed, in those heady golden days before most new-fangled apartment kitchens became stand-alone islands in living rooms, bedrooms were considerably larger than walk-in closets, and den/libraries were not called "home offices," books were ghettoized in their own "serious kind of place." 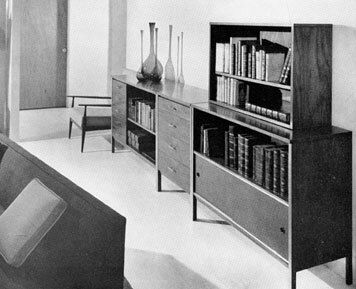 The average apartment in 1956 was no longer spacious, and as Pepis rightly noted, designers were forced to view books as necessary components of their overall design schemes  if only to find ways to fit them into the home. Although covers and jackets were never originally designed to dress up an environment "recognizing that vividly colored bindings of the modern book can be utilized effectively as a positive decorating asset" had become a territorial imperative. Hats off to modernity. "Books today are well dressed," added Pepis. "Gone, fortunately are the gloomy dull-covered tomes of earlier times [the ones that now command high prices on Ebay], forbidding and heavy in appearance." In their place, friendly brightly-colored covers and jackets often with ornamental motifs on the spines made an "effective and pretty picture when used to decorate a whole wall." Separate libraries (a luxury in most average homes) gave way to the idea of bringing books as ornamental fixtures "out into the open" and this has, as Pepis proclaimed, "created new respect for their existence  books share shelf space with the most precious works and objects of art  in recognition of the fact that all these moments of living collectively produce the individual personality of a room by reflecting the interest of its inhabitants." Furthermore, since the basic form of the book had not changed in hundreds of years, most quotidian books exude a sense of timelessness that works just as well in Victorian, Art Deco or ultra Modern environments, and with Danish Modern, Nouveau Siamese or English Country furniture. 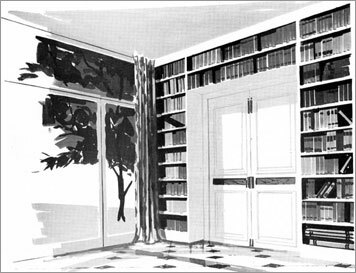 Here, for example, is how the reader was told that books add dimension to the modernistic home of a famous art collector: "The asymmetric placement [of the books] enhances the owner's Dufy water color and provides space of other objects." And the chapter "Tie in With Traditional Formal Décor" addresses how, "French provincial pine paneling... frames books in a formal authentic period living room." Incidentally, if you think that book décor is the last resort of mediocre designers, think again. 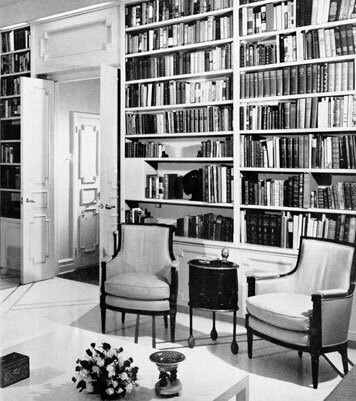 In 65 Ways to Decorate, examples of bookdecor include rooms designed by Eliot Noyes, George Nelson, Philip Johnson, Gio Ponti, Henriette Granville and Melanie Kahane (married to pioneer news anchor and typophile, Ben Grauer). Once these and other respected designers liberated books from being mere vessels of words into what Pepis calls "respected objects of design," they also found that books provided functionality that the original scribes and printers could never have dreamed. In addition to chapters in 65 Ways to Decorate on specific decorative applications, including "Capitalize on Corners," "Be intelligent in Foyers," "Seasonal Supplements for Patios" and "Reading Matters in the Bedroom," books proved to be excellent sound and heat insulation, supports for tables and breakfronts, as well as pedestals, doorstops and other household accruements (though never as coasters). If the past (51 years to be exact) foretells the future, there is hope on the horizon for books. Just as Ray Bradbury's "firemen" in Fahrenheit 451 were the ones who incinerated books, maybe "book designer" will be a synonym for an interior decorator who uses books to enhance the environment. Such, I suspect, is the essence of today's multiplatform design integration. More often than not, I find it bizarre to walk into a home and not see books displayed in an almost proud manner. The house I grew up in had a wall of books that you had to go past when entering the house and for some reason it made the 'house' feel more like 'home'. a good bookshelf and collection makes a house feel a little bit more friendlier and comfortable. especially when you have a good mix of the old and new, soft and hard cover books. I realise this isn't the main thrust of the article, but I couldn't help asking this. Based on my limited knowledge of these matters, but aren't books still the most secure and durable way of storing information? All digital formats suffer from technological issues such as obselescence and data corruption, which books don't have to worry about - until the author languauge itself becomes obselete I guess. As my wife and I are both academics, we've always had many more books than we can shelve. A new house in the countryside with a pitched-ceiling, barnlike 'great room' made me decide that one whole two-story wall should be a continuous bookshelf, with a steel stairway up to a long floating balcony. It's huge, warmly lit, with niches for paintings and objects. And it's magnificent to look at from any angle. It looks like the bookshelf came first, and the house was built around it. When I am dining alone of a winter's night, if I face the lit bookshelf, my eye never gets bored. Like looking at a glowing, ever-changing fire. A massive collage. I discovered another surprising asset. Like most modern interiors, the house has hard surfaces, no window treatments, etc., making it potentially much too live and reverberant for the sound system. And its size makes reverberation even more threatening. In fact, though, the place is magnificent for sound, and not soo blurry. Why?, I ask myself. I am now sure that the wall of books saves the day. Books don't absorb sound, like heavy curtains, but they diffuse it -- send it off in small bits in myriad directions so it never reassembles. Lovely. I grew up in a house with walls of bookshelves, the favourite room in my house has two walls of bookshelves, and I love the bookstore - the bigger the better. There is something about books that nurtures the soul like digital media can never do. Although the contents of large libraries can fit on a couple of DVDs, the experience of being physically surrounded by so much knowledge and effort is exciting to me. The one thing I miss in digital media (and I've been a digital media designer for 14 years now) is the touch and feel of paper - the tangibility and tactileness (is that a word?) of the media. What do we do when "every bit of recorded human knowledge is digitized and available through Google or Jeeves?" All the typophiles, and designers, and book junkies will buy them up. That's what'll happen. I can't wait! I remember a few years back watching an episode of MTV's Cribs where Brandon Boyd (lead singer of Incubus) said, "this is probably the first one of these you've seen on this show." He pointed to a beautiful wall of books. I find it interesting of the countless celebrities interviewed, with the rediculous extravagance in their homes, only one had any books to show. So way to go Brandon. Personally, I stack my books to build walls. Walls that protect me from ignorance. I stack my books to... protect me from ignorance. This is a great quote, one for history, but the fact is that it, in all its weight, will be stored and referenced here, not over there on the bookshelf. This writer became so involved in the stacking of his books that he couldn't see the forest for the trees; he did not realize that books will eventually come to pass here. I saw one of those "do-it-yourself" shows once where the designer was building himself an old-fashioned style library with large wooden bookcases, leather chairs, etc... Absolutely gorgeous room, but he had bought his entire book collection at an estate auction. He "decorated" his shelves with them. He never intended to read one of them. I'm sorry, but that just misses the point! Bookcases should start off empty and be slowly filled over the years with books that you've read. In Atlanta, you can walk into any McMansion and find a fantastic librarywithout one spine cracked. At my house, you have to move a pile of books (Uncle Stevie's of course) or Dwell Magazines to find a place to sit down. You can use Fast Company as coasters since they use that synthetic coated sheet for their covers. A couple years back, being the poor man in a rich man's neighborhood, I was invited to the unveiling of a recently renovated apartment. This particular Master of the Universe surrounded himself with exquisite furniture, beautiful wall surfaces, unique finishes and several hundred books. As is the trend, his designer had made a materials spec sheet available. The only thing missing from the list was that he had obviously made use of the Strand Bookstore's Books by the Foot service. 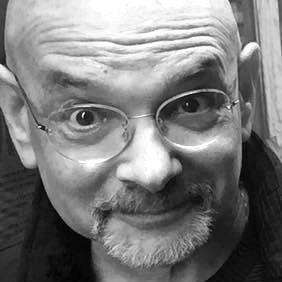 You may find amusement in the fact that many, many of the books were either written or edited by you. None of the spines were cracked and none exhibited any kind of wear whatsoever. I am absolutely flabbergasted by "Books by the Foot!" The site looks like it could be a brilliant parody, but I guess it is not. I suppose you have to admire Strand Books. They've found a way to sell their products to people who don't need/want them for their original intended purpose. There is also something to be said for the sheer insulating value of books. A room filled with books on all four walls has to have a significantly greater R-value than one with none, right? Or, to answer the original post, perhaps all those Reader's Digest Condensed Books and Sue Grafton novels and such can somehow be pulped, literally, to provide blow-in insulation for highly-insulated green buildings! There's a great Talk of the Town piece in this week's New Yorker on Books by the Foot. Reading it I felt deja vu all over again. In the 1930's, Edward Bernays, the father of the field of public relations, and coincidentally Sigmund Freud's nephew, was hired by major American publishers to figure out how to sell more books. 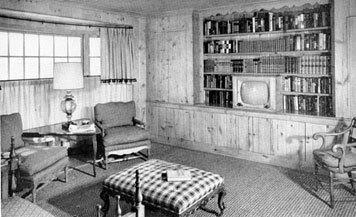 His strategy was to sell builders on the idea of incorporating built-in bookshelves in new homes that would need filling...with books. Those shelves with the spaces left for art and objects remind me that there is a book decorating problem that I always have trouble with: bookends. Particularly in that last image I see only the books falling over and knocking the knick-nacks off the shelves. Death to knick-nacks, I say, but still, I can't remember the last time I saw book ends for sale, let alone nice ones. I'm tired of using horizontally stacked books to book-end my vertically standing ones. Bookends. Bookends!! I think Karim Rashid recommended something like "don't put books in your living room" once. I'm not sure where he said it or why, but my guess is because it makes the room feel more attached to history. Good stuff Steve! Amazing what can be found in a move. ps. For Marian: Bookends GALORE! Ha! That first picture reminds me of the office I had before I sold the ranch. The designer of it obviously read the book, but took it a step farther. The place was a beautiful old brownstone townhouse built in 1896 and renovated in the 1960s or '70s. My office was upstairs and the entrance was similar to that first image. But the doors were hidden. The doors were at the front of the bookcase instead of being recessed toward the back. The clever designer removed the spines from several old books and created fake book shelves on the doors so they were completely invisible to the unsuspecting visitor. That was just one of many things I miss. There was also a similar hidden panel to the right that covered video surveillance of the building entrance and an intercom system. There was also another door on the inside of the room that lead to an upstairs deck with a small swimming pool, plus a huge set of windows looking out on the ranch. The swimming pool was actually mounted on I-beams and there was parking on the ground level beneath it. I only subconsciously thought of it while there, but reading Kingsley's comment reminds me that back in the day I was Master of the Universe. Oh well, the view from the old horse I ride today is much better anyway. I am of the firm belief that books and the printed page will never be replaced by the digital media of our century. Reading an article (even such as this) on screen is tiring on the eyes and can only be supported for a short period of time. Reading a book or magazine is an activity that permits the participant to retire from the active world and lose themselves in a piece of literature. It is an activity allowing for total comfort and seclusion, be it under a heavy blanket in the dead of winter or stretched out on a sunny patio. I take pride in my small but growing library, but also enjoy using old case-bound books found at estate sales and thrift stores to decorate the rooms of my apartment. They add a certain homey quality to the room and make for interesting conversation as visitors spot some rather intriguing titles, like the Modern Marine Engineer's Manual right next to an old Pilgrim Hymnal. Tasty bookends are definitely hard to come by, but I've found the old-school public library ones just perfect. Their slip-free bottom surface keeps things from going haywire, they slide under the last few books to use their weight as an anchor, and their slim profile doesn't try to be anything other than it is. Can we not even imagine a world without electricity? One's books represent too many outlived aspirations; extinct, dormant or nascent obsessions; previous incarnations; dead ends and vain detours. Their spines tell too much. Best leave one room free of the reminders. The rule for that room — maybe a work room — might be: you can bring books in, but you can't leave them there. As for living rooms : too public a space, for so personal a picture. Would that I could afford rooms enough, to afford a room without books. Nicholson Baker took the books used as props in a haberdashery as the theme for an essay, I fuzzily recall. As for decorative color schemes, I prefer the more sober spines of an earlier time, that hold up well to sunlight, handling and other insults. Ah yes, when your room lacks intellectual vitality, spruce it up with those dusty books from your basement. On one hand, the idea of decorating your house with books does seem cozy. A shelf to compete against your DVD collection isn't a bad thing, but at the same time, it seems as though the decorating could be done vainly. A way of decorating without substance. It could easily thwart the purpose of the book as a resource of knowledge to a resource of aesthetic. Just as a fireplace to warm the house can become a center of show for guests. We should never displace function with aesthetic. So lets read the books that line our wall of decor and even share them with our neighbor that comes to visit, instead of leaving them dusty and only to impress the visitor with what we haven't read. Function and aesthetic is the solution for this article. Like others, I grew up in a home where books were important. The only thing of value that my father bought before his marriage to my mother was a TimeLife Great Books set. They are still shown proudly in my parents family room. Along with, of course, the TimeLife great artists books that were very much an important part of my art education. I loved those full color photos and the book sleeves they came in. Even today, in a Wikipedia world, when there is a disagreement at the dinner table when I'm home -- my father will walk over and pull out the relevant encyclopedia. I have find that if I'm in a home or a room and their aren't any books -- that it will be the first thing I notice. And I'll always comment about it after I leave. I found this entry particularly interesting, since lately I have been forced to think about byproducts of design (or even just the overwheling amount of waste we, as humans(Americans) produce in general). And by waste/byproducts, I mean the amount of packaging and building materials (papers, plastics, metals, wood, etc.) that just get thrown into a dump or just simply scattered about the landscape. So, what I gathered from the above entry was not how impressive my book collection is (which is quite limited to begin with), rather, to bring awareness to what should be done about how wasteful we all are. Yes, recycling is a GREAT idea, but, not everyone does it or has the facilities to do so. But, at the end of the above article, it mentions how books are a nice insulator: this leads me to the idea of reusing old materials. So, instead of insulating walls with insulation, why not use old books? I mean, if someone has the resources to fill entire walls with books they will never read, why not put them INSIDE the walls. Sure, one may miss out on the impressive aesthetic beauties of the books lined on shelves, but why double insulate, right? Seriously. Think about this... What if a new library wants to be a green library? Why not use old books to insulate the walls of that library. Now that would give the community something to talk about! The chatter about reusing books rather than burning them (Fahrenheit 451) can be applied to all facets of used materials in the design world. I mean, isn't it true that the majority of our landfills are filled with paper products? Hmmmm. This reminds me of the architect who uses old materials to build new and fascinating homes for people... some homes for free, some for the very rich. I really wish I could think of his name right now, but he also built a church structure from basically nothing but old tires. Talk about resourceful. Basically, I feel that more awareness should be brought to the issues of reusing and recycling materials, rather than how impressive someone's unused bookshelf may be... And I think that was the inspiration of this writing. This latest post about the insulative qualities of books and, in particular, its suggestion that books be installed "INSIDE" the walls, is delightful. Alas, books may not be up to the task. They are vulnerable to mildew and bookworms, and probably to dry rot. They might be suited to some climes, and not to others. And then there's the Fahrenheit 451 factor — they may not satisfy the fire retardant requirements of contemporary building codes.